The shad frenzy is on. 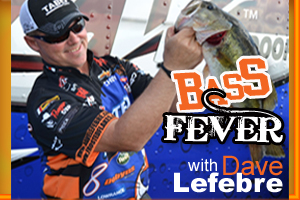 Baitfish everywhere, a flipping, flopping swirling mass of bodies billowing beneath the surface feeding on plankton and driving bass and bass anglers nuts. The sheer amount of baitfish flitting about in the tributaries can be enough to make a bass angler’s eyes bug out like Marty Feldman. We’ve all tried to approach these fish with topwaters, swim jigs, vibrating jigs and soft plastic jerkbaits to varying degrees of success. One day we smash their butts, and the next day we can’t seem to sniff a bite. Bassmaster Elite Series pro John Murray knows the frustration, and he has a fallback that he has used for several years that has produced when others don’t; that lure is a lipless crankbait. His lure of choice has become the River2Sea Twin Vibe lipless crankbait. It is a 5/8-ounce bait with a profile that is slightly smaller than a standard 1/2-ounce lipless bait. The Twin Vibe also features a dual position line tie. tie it on the front one, and it tracks shallower, tie it on the rear one and it wants to run deeper. His color choices are Aurora Black for water that is clear to stained, then he turns to the Pearl White color if the water gets some color to it. That was the key component he needed to trigger bites, and he ended up winning the tournament. His choice of the Tungsten Vibe is because the lure features a tungsten face that helps the lure stand up on the bottom and wag side to side as it falls. 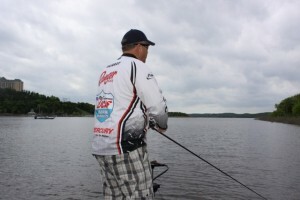 “Bass really like that action in the cold weather,” Murray said.